While I’ve managed to reflect on the conference itself here, on the Sunday after the official proceedings I joined a Health and Lifestyle experience with four fellow bloggers Nicole from Planning with Kids, Deborah from Diet Scmiet and Eleise from A Very Blended Family with the ever-delightful Shelley from Tourism & Events Queensland behind the wheel of the mini-bus. We started the morning off with yoga in the park with Laura from Essence of Living. 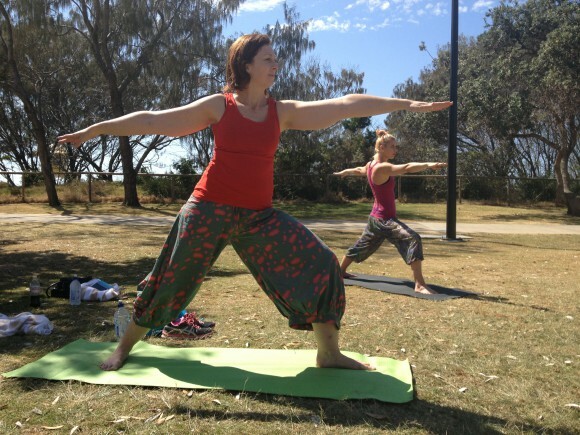 It was a beautiful sunny Gold Coast morning and although the park was pumping with sun-seekers of all ages, I was soon blissfully unaware of the noises around us as Laura took us through a energetic, yet soothing yoga class. She even helped me out with my shoulder stand at the end, which was especially cathartic given my post before the #pbevent. From there, we had a bit of free time to explore the adjacent Gold Coast Arts & Crafts Market and I got a little carried away buying Avocados, Macadamia Oil and nuts and some Cacao, Chia Seeds and a super food mix – well it was keeping in the theme of the day! Back in the van, the next stop was The Healthy Gourmet for a raw food demonstration and feast. Chef Alessandra Alfredo took as through how to make a range of dishes, including a green smoothie, a green soup, zucchini pasta with sun-dried tomato and capsicum sauce, a chocolate & chia slice and a lime cheesecake. All the dishes were absolutely delicious and demonstrated how quick and easy it is to prepare raw food dishes. Tummies full of Alessandra’s delectable dishes, it was time to work it off with some Stand Up Paddleboarding (SUP) with Brad Holmes Surf Coaching at Budd’s Beach. I was more than a little nervous, yet also excited, to be trying SUP for the first time. After a brief Tai Chi warm up (Brad is also a qualified Tai Chi instructor, surf coach and also a cartoonist) we were given a demonstration on how to get going and find our feet on the board. I was first to take off and following Brad’s advice to get used to paddling on our knees first, I got stuck there for quite a while as I plucked up the courage to get up to my feet. And when I did, it really was very relaxing and quite a good workout. The boys had made it down to watch me and I could hear Jarvis yelling out encouragement as I paddled along. It was such a pleasure to spend a day devoted to healthy pursuits while enjoying the Gold Coast sun and scenery. I’m already looking to do SUP again and the raw recipes we tried will definitely find a regular place in my recipe repertoire. The day inspired me to keep making the healthy changes that I’ve gradually been implementing this year too. Special thanks to Tourism & Events Queensland who hosted this great day out! 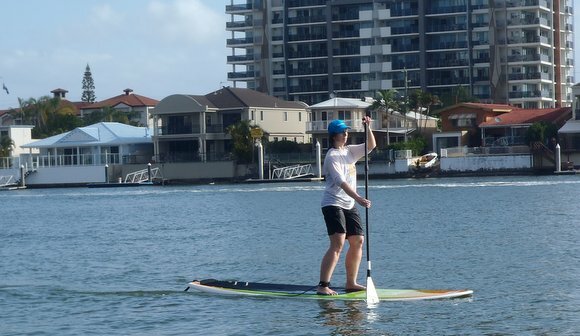 This entry was posted in Health & Wellbeing and tagged #pbevent, gold coast, raw cooking, SUP, yoga. Bookmark the permalink.